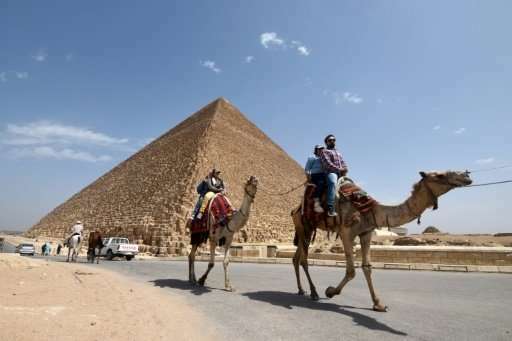 An Egyptian archaeologist overseeing a project to scan a pyramid for voids on Saturday criticised the announcement of a discovery of a passenger plane-sized cavity in the Great Pyramid. It is thought to be at least 30 metres (98 feet) long and located above the "Grand Gallery"—a sloped corridor almost 50 metres long and nine metres high which links Khufu's burial chamber at the pyramid's centre to a tunnel leading outside. The monument—139 metres high today, and 230 metres wide—was erected as a tomb for Khufu, also known as Cheops. To this day, nobody knows quite how it was built. what is it now ? wake me when it's some thing more unofficial. like is it working ! or are you still playing with it? What the fake Egypt-ologists won't tell is that the pyramids were built in 71,344BC, by our ancient forefathers who came here 22million years ago. . (The Pleiadian Mission by Randolph Winters based on precise data give by et in theyfly.com). They were built by androids. (The Far Sight Institute). Extremely high tech machining that cannot be replicated today was used, Chris Dunn YouTubes. 22 million years ago? Consider the moon, a 5B+ year hollow, titanium crusted artificial satellite that if natural should be 30miles diameter but is a 2350miles diameter planet. David Icke The moon is not what you think it is. I'm just gonna start reporting this spam and crankery until physorg starts enforcing their guidelines. Getting so fed up with having to press the "ignore user" button. Anyone familiar with the current state of Egyptology is familiar with the rancorous, erratic, peripatetic, and --some would say-- petty and vindictive, Zahi Hawass. This is sort of SOP for him, and, not for the first time, he has been involved directly or indirectly, and possibly in the executive capacity, to enable a certain avenue of inquiry to be officially pursued, and then to criticize the findings. Most recently this occurred with respect to the Great Sphinx. Now we see the same scenario play out again. And to no conceivable purpose. It's one thing to make a claim like this, and quite another to produce evidence in support. Unfortunately for Egyptology, and for those interested, Hawass indulges in this muddying of the waters and obfuscation to an unkown(to us)end, and no one seems to be able to compel him to substantiate either claims or ends. We won't be seeing any objective, verifiable findings that validate his claims in this matter. While plenty of effort has been put into detecting additional chambers within the GP, not much of it can be established with any certainty. Even assuming that, like some of the other pyramids, the GP features these "relieving chambers", as they are called --and this is by no means unlikely-- that is still no guarantee that they are used in the same fashion as in other pyramids, since they are seen to evolve in both construction technique and purpose over time. Ultimately, this idiocy resolves itself upon two points, firstly, that Hawass won't be ponying up ANY evidence to prove what he is saying, besides the anecdotal, and secondly --if he, in fact, possessed this information-- why didn't he make it available to these researchers, in order to avoid just such an embarrassment as this?